This past weekend we went to our local fair. I have never been to this particular fair. And to be honest, I don't know the last time I have actually been to a fair. It has been a long time. Ian and Connor indulged in a little, or rather large, ice cream cone. Connor actually only had one bite. Many times he doesn't like the cold on his teeth. 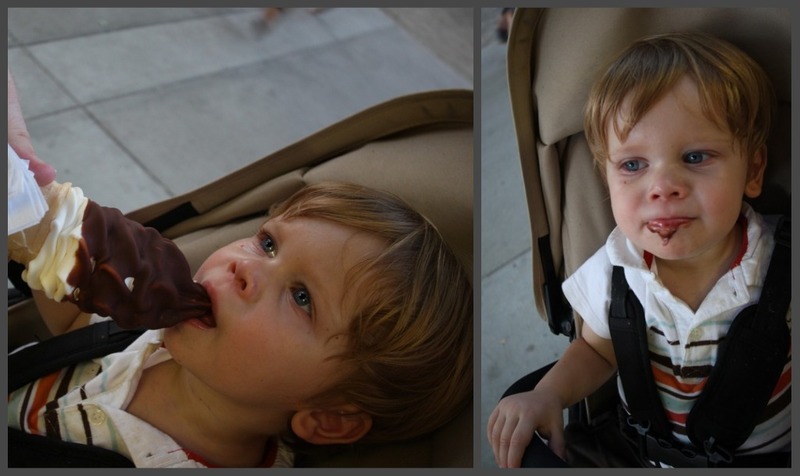 Plus, he likes to feed himself and there was no way he was going to be allowed to handle that ice cream cone. Connor's favorite part of the fair was the petting zoo. I wish the pictures could show just how excited Connor was about touching all the animals. He was so excited, he could barely contain himself. He loved inspecting the animals, touching their faces and feet. He seems to be doing better about being gentle, which makes me happy given that a baby will shortly be at his mercy. 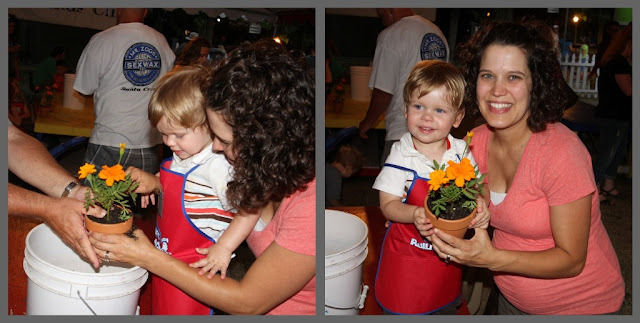 Connor also got to plant a flower at the fair. I'll be honest, I only took him to do this so he could get an adorable little apron. It is so freaking cute. I thought Connor would enjoy playing in the dirt, but he didn't seem interested in touching it. Basically grandpa scooped the dirt up and Connor would turn his hand upside down over the pot. He was a big help. But hey, we got a free flower out of the deal. A flower that is now sitting on our front porch and will hopefully stay alive more than a week. I'm not the best with plants. All in all, we had a good time at the fair. But at the same time, I could have missed it and totally been happy. All the crowds and dirtiness aren't really my thing. I love the frequency of 'We gave Connor ice cream but he didn't eat it/he had one bite/he ate the cone only." Heehee! That apron was totally worth the dirty hands. I love your 'He was a big help"... Your sarcasm is hilarious.